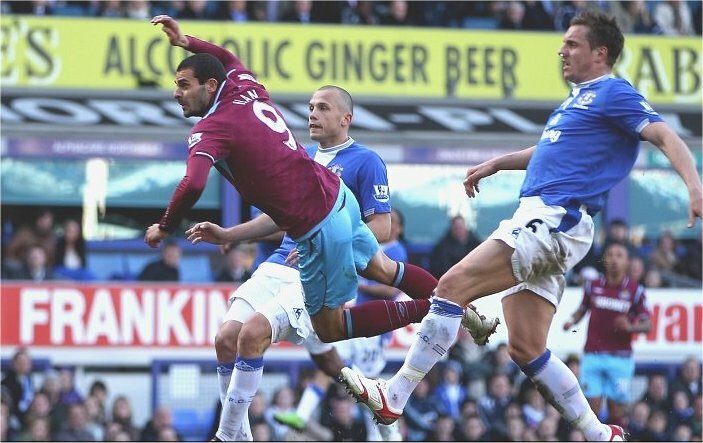 West Ham twice came from behind at Everton to claim a crucial point in their Barclays Premier League relegation scrap. Manuel da Costa and Ilan both struck in the second half as the Hammers produced a battling display to end a damaging run of six successive defeats. Diniyar Bilyaletdinov opened the scoring and Ayegbeni Yakubu looked to have won it for the Toffees six minutes from time but the Hammers, who also missed a penalty, produced their best performance in weeks. After a disjointed first-half display, gaining a draw was an unexpected bonus that lifted them one point clear of the bottom three. That was no more than the visitors deserved for a battling showing after the break, Scott Parker typifying their effort with an outstanding display in defence and attack. The only blight on his performance was a booking which means he must now serve a two-match suspension. Fate had appeared to be conspiring against under-pressure Hammers boss Gianfranco Zola before kick-off. Having already lost Kieron Dyer, the Italian was forced to make a late change when Valon Behrami was injured in the warm-up. After initially been named among the substitutes, Junior Stanislas was unexpectedly promoted to the side while Josh Payne was handed a place on the bench. Everton made just one change, and it proved a key one, with goalscorer Bilyaletdinov starting ahead of Jack Rodwell. The match started slowly but West Ham finally got a sight of goal when Parker fired well over from a corner. Everton's first opportunity came from a free-kick but Leighton Baines shot straight into the wall from 20 yards. The hosts got another chance from slightly greater distance after Parker earned that costly booking for a late challenge on Tim Cahill. This time top scorer Louis Saha took aim but sliced his effort well wide. Everton stepped up the pressure to claim the lead after 24 minutes. Jonathan Spector attempted to head away a Baines cross but found only Cahill, who nodded back for Bilyaletdinov to glance in from close range. Cahill then threatened a second after a driving run but dragged his shot wide from the edge of the box. The Hammers were gifted a potential route back into the game as referee Howard Webb pointed to the spot after 37 minutes. Sylvain Distin clipped the back of Carlton Cole's legs in a clumsy attempt to shepherd the ball back to Howard as the striker raced onto a fine ball from Parker. Distin was the last man but Webb showed leniency and brandished only a yellow card, but Howard saved Mido's spot-kick. The on-loan Middlesbrough forward's effort was destined for the bottom corner but the travelling fans' general dissatisfaction with his performances became evident as they sarcastically called for him to be sent off after a poor challenge on Steven Pienaar. Bilyaletdinov then spurned a chance to compound West Ham's misery when he curled a shot over before the break. The opening to the second half was scrappy but the Hammers were at least competitive and did most of the pressing. Another chance almost opened up for Mido from a Stanislas pass but his touch was heavy and Phil Jagielka cleared. That gave the visitors encouragement and Mark Noble was unlucky to see an opportunistic chip from the edge of the area hit the crossbar with Howard beaten. West Ham earned their reward on the hour as a Noble corner fell between a group of players in the Everton area. Da Costa was the quickest to react in the ensuing scramble and forced the ball home for an equaliser. The Londoners at last had momentum and Cole went close to adding a second with a low shot that just went wide. Everton had been lethargic since the interval but felt they should have had a penalty when Saha went down under a Da Costa challenge. The Frenchman appeared to have nicked the ball past Da Costa when he was tripped but Webb told him to get up. Everton looked to have snatched victory six minutes from time when Yakubu, a replacement for Bilyaletdinov, rose to meet a Baines cross with a powerful header. Rob Green had little chance of saving it but the Hammers were not beaten. They responded instantly as Julien Faubert broke down the right and delivered a pinpoint cross for the onrushing Ilan. The Brazilian, who had ended Mido's unhappy afternoon when he came on with 13 minutes remaining, dived forward to meet the ball with an excellent header that flew past Howard. Zola leapt for joy and his side held on to claim a deserved and potentially vital point. Everton Howard, Neville, Jagielka, Distin, Baines, Pienaar,Osman (Rodwell 83), Heitinga, Cahill,Bilyaletdinov (Yakubu 65), Saha. Goals: Bilyaletdinov 24, Yakubu 85. West Ham Green, Faubert, Da Costa, Upson, Spector, Noble,Parker, Kovac, Stanislas (Gabbidon 90), Mido (Ilan 77), Cole. Subs Not Used: Kurucz, McCarthy, Daprela, Spence, Payne. Goals: Da Costa 60, Ilan 87.